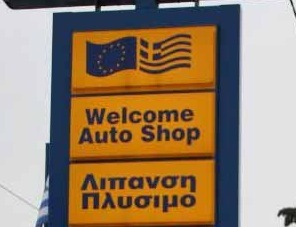 Planning to rent a car in Greece, or are you a resident addicted to your car? Gas/petrol prices vary greatly throughout the country depending on the neighborhood, brand and gas station owner, with Greek islands always higher. The average price of unleaded gas/petrol in Greece hit a record €1.849/liter or $9.15/gallon on April 10, 2012, though prices reach €2.05/liter or $10.15/gallon in many areas. Greece, Germany, France, Italy, Spain and the UK were all at record-high retail prices as of April 2012. Greece charges 57.67 percent tax on fuel as of 2013 — the second highest rate in the EU behind Sweden — and the price of fuel in Greece is the sixth highest in the world, according to a 2013 Bloomberg survey. See daily updates at gasprice.gr (multilingual) and the Ministry of Development’s website (Greek only). The price of petrol in Greece has skyrocketed since consecutive fuel tax and value-added tax (VAT) increases were imposed February, March and July of 2010 and January 2011 to raise money for the debt-stricken economy, and the government demanded mandatory issue of receipts on April 1, 2010 to crack down on tax evasion. Demand has fallen as households cut back, but price fixing and price gouging remain common practices. Cosmote, Vodafone, Upstream and Wind mobile/cell phone users with Android can get cheapest price of fuel in Athens by sending a free sms with their location to ‘54151‘ and Thessaloniki from September 19, 2011. Drivers on Attiki Odos can also see the price of gas at the next three stations displayed on electronic billboards. The service began in April 2011 and is available across the mainland and Greek islands as of October 2011. Some gas station owners install electronic boxes on their pumps, which can be controlled remotely to slow the flow of gas while the price remains stable. This results in the customer being charged slightly more per liter. It is illegal and subject to fines of at least €5,000 and immediate revocation of the offender’s business license. A list of 219 gas stations fined for irregularities during unannounced spot-checks was published by the Ministry of Environment (YPEKA) on December 15, 2011. A liter is significantly smaller than a gallon, so one (1) gallon = 3.785 liters. If you would like to calculate a figure in dollars/gallon, take the price and multiply by 3.785. For example, €1.25 x 3.785 = €4.73/gallon. Now convert that to dollars: €4.73 x 1.36 (US$ exchange rate) = US $6.43/gallon. To convert the price in liters to your currency, go to www.xe.com, insert the figure in QuickConverter and choose your currency from the drop-down menu. Exchange rates fluctuate daily. I provided you with the tools to make the calculations yourself not only because my audience is global and it’s impossible to satisfy everyone, but also to empower you with knowledge you can use in the future. Below is a table compiled from the kind participation of readers and figures taken from the Ministry of Development’s website in 2008. It is impossible to update and code this table on a daily basis, as prices change quickly and constantly. But it illustrates the range of prices by region, so you can plan your vacation budget accordingly. * If the figures differed greatly between the Ministry of Development and readers in Greece, I favored those provided by live people on the ground who took the time to survey prices today. I pay, on average, 1.25 euros/litre for regular unleaded gas. My husband’s found a great petrol shop in Pallini and pays, on average 1.50 euros/litre for “100” unleaded. Same shop. I drove down the road from Iraklio to Archanes, called Leoforos Knossou. It’s a well frequented road as you might guess, with both the General Hospital and the Knossos Minoan Palace in its way and Archanes, highly advertised as a “paradosiako chorio” as its end point. I intended to drive Knossou down to the center (about 3km), but it was so jammed that I gave up on that. Might try later this afternoon when the shops are closed. P.S. The Minoan Palace sits about half way between the 2 Shell stations. Although gas is VERY expensive in Greece (and all over Europe, for that matter) most Europeans drive a fraction of what people in the United States Drive. When I was in Greece, I could simply walk to a variety of small grocery stores (which were all less than 1 km away). I also had the option of taking a taxi, a subway, the metro or even a bus. The transportation options were amazing! Here in the US I live in a small, farm community in the middle of NE Colorado. If I have to buy something, I have to drive to Denver (90 miles away). There is no public transportation, there are no metros, nor do we have public buses. I have no choice but to fill up my tank, pay $50.00, and drive to Denver and back. When I was living in CA, I tried the Metro-link to get to work. It was $12.00 each way. I would spend $24.00 a day trying to get to work (35 miles away). I couldn’t afford to live close to work because of the cost of living in Orange County. I ended quitting my job and going back to school. That was in back in 2003 before gas prices sky-rocketed. That said, I am not sympathetic to those drivers in the US who wanted BIG everything: Big SUVs, BIG trucks, and V8 sedans. Mass consumerism has driven many people to be wasteful and inefficient. I do feel bad for those people in Greece who rely on their vehicles for their livelihood: the taxi drivers, the delivery men, and the truckers. And I do sympathize with those people in Greece who have to drive to work. I don’t know how those people are able to make a living paying over $8.00 a gallon for gasoline. Seems to me that in NYC, the transportation system should be pretty good? Not sure of the price? As with Athens, in the big apple, gas prices might not have as big of an effect as a farmer in Colorado I guess. Within the geography of NYC itself, which is rather extensive, you can pretty much ride the subway or the normal bus system for an unlimited period of time for $2 a ride, so long as you do not exit the subway system and that includes only a single bus transfer. Express buses from the outer edges of the boroughs to the city are $4 each ride, no transfer. The commute from the suburbs is about $6-14 dollars per ride, but if you are commuter you buy a discount monthly pass that gives you unlimited access for between $140 and $200 per month (depends on how far out the lines you are going). For commuting these systems are reliable, air conditioned in summer and heated in winter and pour into four transit hubs in Manhattan, from which a subway ride takes you where you need to go. Gas prices here are around $4.25 per gallon. People still drive. The tolls to get into the city are now $8 but there are still free bridges on one side. The thing about NY is that because of the traffic changes of two years ago, it is much quicker in Manhattan to take the subway when possible, otherwise you often go 4 or 5 avenue blocks out of the way because on certain streets, you cannot make turns except on the outermost avenues. They have not yet resolved the commercial traffic issues and the construction issues here, the congestion zone proposal failed (it was structured like London, not like the Delta). Gas prices have not affected a lot of commuters here because we have a tax benefits employers can give to their employees to offset commuting costs, and a lot of employers in the city reimburse parking. I do not think we have the kind of concentration of private drivers during the day here. It is my impression that a very substantial portion of the traffic in the city during the workday is commercial trucks and vans, taxis and black cars. The black car rates went up about 15% last fall. Taxis are soon going to strike for a fare increase to offset gas increases. The straphangers association says there is a substantial increase in train usage, but MTA has also cut some trains to some areas to be more fully productive. There are still many people who live in Manhattan who do not have cars, but in the outer boroughs, many people do have cars but don’t use them to come into the city any more. V – In places where public transportation is not widely available in CA, many people car pool. You call a phone number, they hook you up with someone in yr area who has a space in their car, give you the meeting place and you’re good to go. My brother has plenty of money, but he does this 4 times a week because it’s environmentally sound. My sister-in-law’s employer (a well-known company) has a company paid shuttle to meet commuters at train and bus stations and also provides free transport to airports for those who travel for their positions. It saves them money in the long run — no administrative hours for accounting, reimbursing gas, tolls, taxis, parking, etc. I worked for a company like this also. We were given a monthly allowance that paid half our commuting costs, which worked out great if buying a monthly card at a 30 percent discount. In the end, I paid only 20 percent. The S – NYC is quite good. Commentator A has more info. A – Indeed, I found NYC transport very efficient and affordable considering what you get and the cost. Owning a car was inconvenient with so many trains, buses and other options available. I only used a taxi or black car service to the airport if I had a lot of luggage or if my shopping had gotten out of hand. Even when I lived in NJ, it was so easy to get on the train, have some quiet time, get off in the city, get on the subway or a bus, walk a couple of blocks, upon which I could stop for breakfast at dozens of great places, and be at work. Even when it’s snowing, a couple of blocks is no big deal. Super convenient. The only time I experienced inconvenience was during 9/11 when MTA understandably could no longer run some lines, all movement ceased, and we had to walk home. I live 30 minutes outside NYC, on Long Island, where you need a car to get anywhere. The suburbs of NY were not developed for foot traffic for some reason. People here are hurting because gas is high, food is high, the housing market crashed, the stock market is way down, and no one can unload their Hummer or their overpriced McMansion. I have many friends who have thought twice about leaving NYC in the past 18 months, primarily because of the cost of daily life ourside the city. In some parts of NYC, it is difficult to do something like a major shopping expedition without a car. But most of us have small apartments and small refridgerators and shop every couple of days anyway to get fresh food. Outside an environment with real population density, you cannot compete with a small grocery store in walking distance. As in LI, and in many other places in the US, price competition made superstores and superstores need big plots and parking lots. I personally found it a relief to give up my car when I moved here. It was only 10 years later that we bought another one, which we did for safety reasons. But even so, I park in a garage far from my apartment, because I just don’t need it that frequently. The difference in garage fees is $600 per month and the garage is accessible by subway. Even on weekends we never drive downtown. On the other hand we have friends who live downtown and keep two cars and drive everywhere. Here in Melbourne petrol (gasoline) prices have risen steadily over the past five years from AUD 75cents to AUD$1.60 per litre, causing significant public outcry recently. But I notice this is still less than 1 euro (my aunt lives in Irakleio and having been there recently I can verify the very high petrol price). This is perhaps balanced by the fact that the city here is much more dispersed compared to large, vertical Greek cities (hence people here often live more than 10km from work), but then again the transportation system is quite reliable here. Phillip, I hear you. Thank God we live in Greece where nobody complains about anything. Those darn Americans complain and let them, but thank God the Greeks are the kindest, gentlest group of non-complainers I’ve ever run across. he he, that’s right. i’m glad i live in a country where everyone is happy all the time and never complains about anything. if you look up happiness in the dictionary, you see a map of greece, really. I don’t know that Greeks are all that happy. They just don’t care because they aren’t going to do anything about anything. They complain as well as anyone else. Phillip and the Scorpion are being cheeky monkeys. But there is some truth in their comments. Most people I know don’t even pay attention to the price of petrol/gas because they’re so against using public transport and addicted to their cars, they’ll pay any price…or are apathetic. I’m starting to believe Greeks in Ellada have it made…and it’s true…No one cares about prices…people walk into supermarkets, department stores, without looking at prices…People go on vacations and max out their credit cards … that’s life!!! Greeks in Ellada should stop complaining because no one lives like a GREEK! Are you insane??1.40? 1.75? Have you actually even seen such prices? and you assume the average from the above table? Do you even know math? Actually, what the article says is the news reported prices of 1.40 on average. It doesn’t say it was an average based on the table. The table was compiled from data from readers (not cronies) and stats are directly from the Development Ministry (end of June) not the media because people like you need that kind of evidence or otherwise start name calling. Prices are higher now after only 1 week, but you failed to even click the link to check. I don’t see how it’s misleading or how I’m insane if it’s based on hard data. In reality, prices higher than 1.40 were seen, not only by myself but by many from all over mainland Greece and the islands, in addition to the Development Ministry confirming that. Have you taken a survey of the whole country as I have? (Simply looking at Thessaloniki and one part of Athens doesn’t count as the whole country). During the gas lorry strike, the news showed live footage of prices at 1.75 at gas stations in Hania, and readers have photos as proof. Of course it can’t be that YOU aren’t paying attention or aren’t informed. It’s so much easier to blame and fault me. Typical. I know algebra, calculus and trigonometry. You? To begin, I’d like to thank you for posting on my blog. Saddly I have to incist that your article on gas prices is indeed missleading. Perhaps you yourself have been missleaded by your source(the greek media…). Anyway I didn’t mean to offend you in any way and didn’t intend to call you names. Sometimes being behind a screen can cause untimely expressions. As for my critisism on the agora( I see you’ve done your homework) you did misunderstand a few things. When I was talking about poetic b…it I was not refering to you or your site. As I mentioned before I dont mind critisism about Greece or Greeks. I am not the kind of people that take offence from critisism aiming at their country or the people leaving in it. In fact you may have noticed(if your greek is adequate) that in many articles im my blog I have many harsh things to say about my fellow citizens. And I can assure you that the problems of living in Greece bother me more than they bother you. Besides you chose to live here I didn’t. In fact I have often thouhgt of moving to another EU state, but the quality of life that the greek sun and nature provide kept me from doing so. And my critisism was never based on the fact that you r not greek(I even thought you had greek origins). So don’t put yourself in a defensive position with no reason. Anyway maybe we are indeed on the same page. I promise you that from now on I will try to become a regular commentator on your site and try to give a more realistic(in my opinion) view on what things in Greece are like. A – My sources were readers who viewed prices with their own eyes, and the Ministry of Development stats, so I stand by the article. Your comment about “poetic bulls..t” was mixed with unflattering things that did indeed refer to me, i.e., “A load of missleading crap” and “nothing that can’t be found in my Big Fat Greek Wedding”; “I don’t need an imigrant’s flattering poetry bulls..t” and she depicts Greeks as fustanella wearing donkey riders. I don’t see any grey area or where I misunderstood anything, but I’m willing to give everyone the benefit of doubt and a second chance. I am only as much an inhabitant as this country lets me. Meaning, I will always be a non-Greek and be treated as an outsider no matter how much I have adjusted to life here and changed myself to be more “Greek.” So if I’m treated like an outsider and a foreigner, there is no way I can fully integrate; and perhaps I don’t want to or can’t and that’s OK with me and I accept that because at my core, I am still an individual. Can you understand that? I also live each day as if it’s new and do my best to not be jaded by life here; that doesn’t mean I’m clueless, it just means that I still see the good and bad in everything. You must have thought in the back of your mind I wasn’t a tourist, even though you claim I sound like one, because you admit to thinking I had Greek origins. The things I choose to talk about are common stories in which many people across all nationalities can identify, however I’ve never seen anyone publish them publicly in English — many times I do it to dispel stereotypes or shine light on darkness. There is a lot on stereotypical ignorance of newbies, Greeks coming to live here/going back, trailing spouses, people coming to build/renovate a second home or retiring, and somewhat ridiculous tourist accounts. I’m the only sketo American woman I know who made it here on her own without a Greek/EU spouse, without help from her parents, and still lives and works here after 11 years (there are two other women here a shorter time, but they don’t share their experiences). My perspective may be new or at least different, and many of the subjects I cover aren’t done anywhere else, but I don’t claim to be grassroots unique. I welcome your comments and hope we can build a bridge of understanding. Just please remember that your reality as a Greek man in Greece is heaps different than my reality as a non-Greek woman in Greece — they are both “realistic.” One is not better or more right than the other. They’re just different and always will be. Thank you for coming back. I appreciate the fruitful dialogue. P.S. You were not blacklisted, so I’m not sure what your last comment refers to. * Comments irrelevant to Petrol/gas prices in Greece were returned to the holding queue (not deleted) as per my stated comment policy. I’d previously allowed off topic discussion, but my goodwill was not reciprocated.